Remember when vegan selections were a blip on the dinner menu? It was hard to eat out at all if you chose a vegan lifestyle. These days, whole sections of the menu are dedicated to vegan dining. 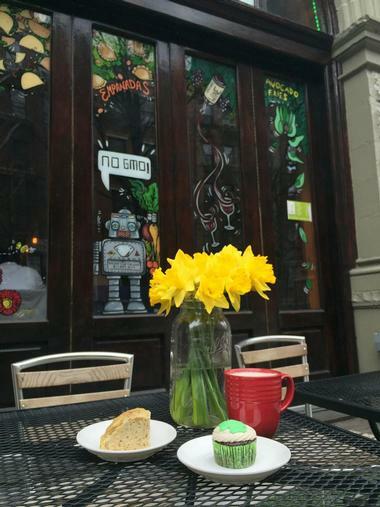 Even that’s not enough; now you’ll discover vegan restaurants popping up in nearly every New York City neighborhood. Vegan restaurants are building their brands with unique spins on the vegan dishes. Avant Garden has one simple mission: to raise the bar on fine vegan dining, and Chef Tony Mongeluzzi does it with ease. 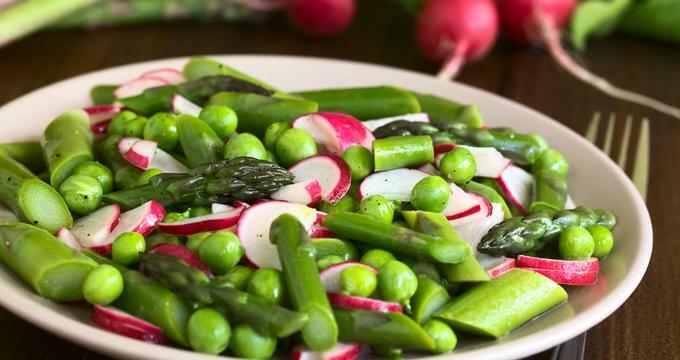 He uses his extensive ingredients – greens, fruits, veggies, grains, nuts, legumes, spices, and herbs – to create masterpieces that are creative, gorgeous, and delectable all at once. Beginning with his Toasts that include items like Fennel Hummus with caramelized fennel puree, orange, and walnut to his Hots like Pappardelle with house-made pasta, Pomodoro, and herbed gremolata. These perfectly crafted dishes allow the ingredients to be truly appreciated for their individual flavors while complementing their counterparts for a truly Avant Garde vegan experience. 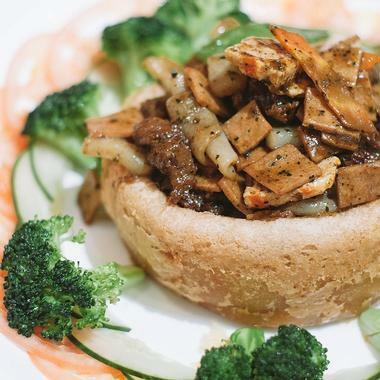 Seasoned Vegan is owned and operated by a mother and son duo, Brenda and Aaron Beener, who pride themselves on providing a 100% organic, vegan menu while designing dishes that can satisfy even the most unconvinced omnivore. Their global menu is inspired by Italian, Asian, American, Middle Eastern, and Caribbean recipes, all made with a soulful twist. Simply put, they describe it as “the food you love, veganized.” Diners will appreciate everything from the pizza quesadilla to the tuna roll starters, followed by an assortment of burgers, wraps, salads, and eclectic entrees like their Crawfish in garlic basil. 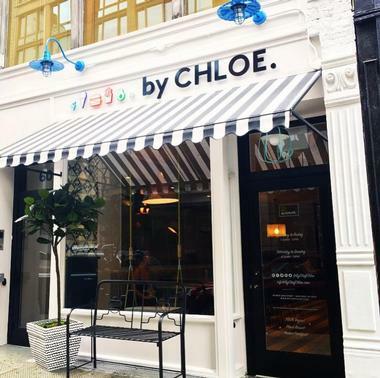 By Chloe was created via a partnership between ESquared Hospitality and Food Network’s “Cupcake Wars” winner and vegan Chloe Coscarelli to provide quality vegan food to multiple parts of the nation. 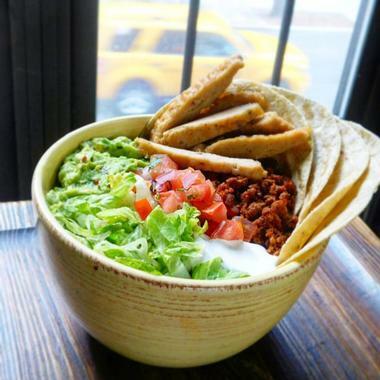 Diners at the West Village location in New York can delight in a wholesome, plant-based menu that is designed to nourish and energize the body. By Chloe’s menu consists of traditional American fare made vegan-style and features fresh salads, sandwiches, burgers, a few pastas, and even a brunch menu. With dishes like the Whisky BBQ sandwich with smoky Portobello mushrooms and sietan, sautéed kale, onion marmalade, grilled pineapple, and bourbon barbeque. What’s not to love? 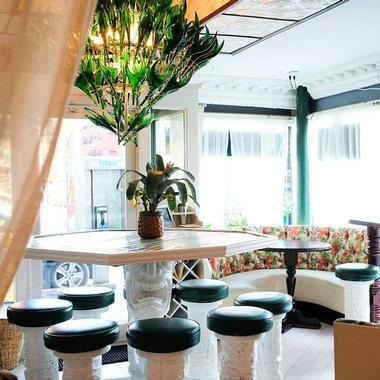 Toad Style is a quirky neighborhood spot in the Bed-Stuy neighborhood of New York City. 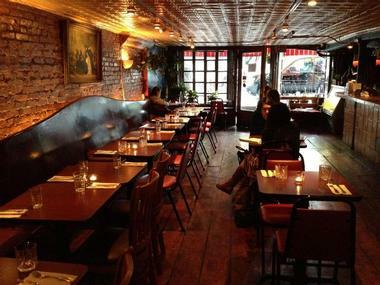 They serve American-style vegan food in kung fu-style surroundings. Their simple, classic menu is 100% vegan, free of soy and palm oil, and it is gluten free to boot. Diners can indulge in select, but oh-so-delicious sandwiches and out-of-this-world sides with an emphasis on all things fried. The Toad Style house burger features a mushroom and lentil patty topped with almond cheese, aioli, and traditional fixings, which can be paired with hand-cut fries, cheese or pizza fries, fried cauliflower, or fried pickles. 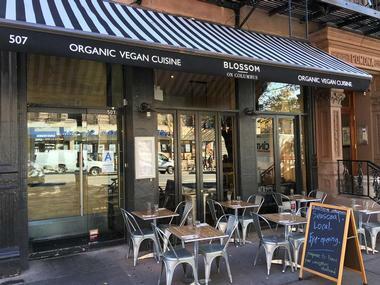 Blossom Restaurant was established in 2005 by animal and food loving co-founders Pamela Blackwell and Ronen Seri. Their original location is in a historic Chelsea townhouse, the perfect eatery for those wanting an intimate dining experience. The menu draws from only fresh, organic ingredients that come directly from small distribution centers and local farms to create delectable earth and animal-friendly dishes. The restaurant serves up lunch, brunch, and dinner daily, and guests will find starters such as Buffalo Risotto Croquettes, breakfast delights like the Blossom Benedict, and dinner entrees like their Seiten Scallopini with white wine, lemon caper sauce, and sautéed kale served with truffle mashed potatoes. Restaurateur Pamela Elizabeth in 2010 established Blossom du Jour when she decided to fill the ever-growing need of the masses’ searching for healthy fast food. Every one of their dishes is environmentally conscious, healthy, 100% vegan, and made-to-order quickly. The restaurant is open for breakfast, lunch, and dinner, and guests can choose from an assortment of delicious breakfast bowls, wraps, and muffins as well as salads, sandwiches, burgers, sides, smoothies, and shakes. 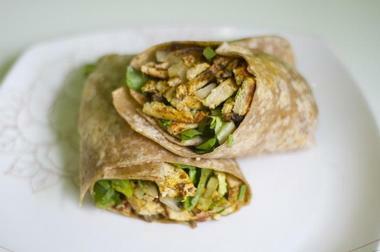 Visitors can get their day going with a Benedict Wrap and end it with a juicy Beet Burger with some Buffalo Cauliflower Bites, Onion Rings, or Mac N Cheese on the side. 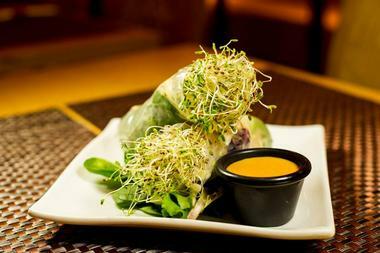 Franchia Vegan Café offers a casual take on the more refined principles of Asian fusion vegan dining. This multi-level space evokes a contemporary elegance with traditional Korean decor, and it is the perfect eatery for a quick bite during lunch or an evening of laughter with friends. Their eclectic menu provides varied selections for both lunch and dinner, which include sushi and vegan tapas. Guests will find Quick Bites such as Crispy Scallion and Spicy Kimchi pancakes, an assortment of dumpling offerings, and specialties like Singapore Curry Angel Hair – thin rice noodles with vegetables, and “lobster” balls stir fried in a house-made curry sauce. 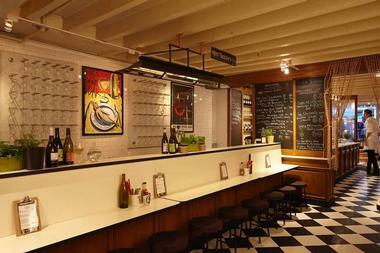 Candle 79 is the upscale sister restaurant to the extremely popular Candle Café. This premier vegan oasis provides fresh food from the farm straight to the table. Visitors will enjoy a completely sustainable experience from their organic, locally sourced, and seasonally creative menu to their eco-bar featuring organic wines, craft beers, and signature spirits. Their menu consists of brunch, lunch, dinner, and dessert options along with ever-changing daily specials. Homestyle Pancakes topped with seasonal fruit, Nuevos Rancheros utilizing spicy tempeh potato hash, and polenta cake Benedicts start it off, with Pan Seared Dumplings, Spaghetti & Wheat Balls, and Herb Grilled Cauliflower bringing it home. 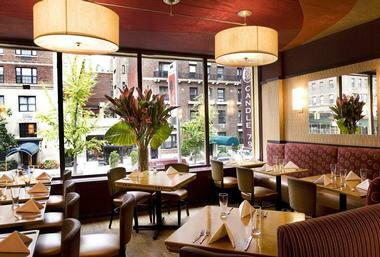 The Candle Café has a long history in the Upper East Side neighborhood, dating all the way back to 1984. Over the years, it has changed hands, but it has always remained a community staple. It is currently the well-known, casual local hot spot for those looking for delectable vegan food. The restaurant boasts a menu that features only local, organic, seasonal ingredients, and guests consistently receive dishes that do not disappoint the palate. Their eclectic menu consists of small plates like Truffle Potato Fries with acai-chipotle aioli, appetizers like Fried Avocado Tacos, and mains like the Portobello & Black Bean Burger and Mexican Lasagna. Caravan of Dreams is owned by Angel Moreno, a Spanish expat who brought his passion for health, food, music, community, and the arts to East Village in 1991. Moreno’s deep respect for the elements shows through in the restaurant’s green design elements like energy-saving lighting and structured water. He has developed an all-vegan menu using only organic and kosher verified ingredients and created everything from Beet Ravioli starters to Warm Brownie Sundaes for dessert. Hearty items like the Caravan Burrito stuffed with Sietan, black beans, Spanish rice, sautéed vegetables, and traditional toppings can be found next to light and fresh choices like the Green Garden Platter. Go Zen is a beautiful creation that came about after two of the most well respected vegetarian restaurants, Zen Palate and Gobo, closed. The cooking staffs of both locations decided to join forces and create Go Zen with an entirely vegan menu that incorporated a few of the signature dishes from the previous locations. Their commitment to the health of their guests is what has inspired them to create an innovative, organic, and natural Asian-infused menu. Guests will find handmade Happy Dumplings, Cedar Sauteed Udon, Pad Thai, Pesto Linguine, and even a Go Zen house burger, among other delights. Le Botaniste restaurant offers a responsible food concept that caters to the health of their patrons and planet. Their 100% botanical and 99% organic Eastern Hemisphere-inspired menu consists of plant-based bowls that feature a starch base, sauce topping, and choice of garnish. 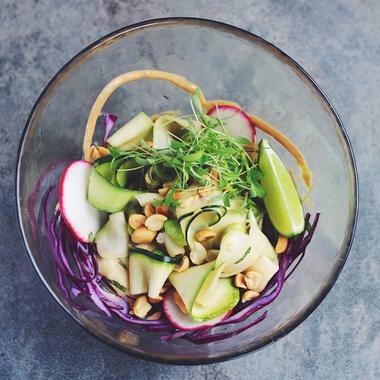 Guests can choose from small bowls like their Young Coconut Ceviche and large bowls like their Dirty Noodle, or they can create one of their own. The DIY Bowls allow guests to get creative, choosing from bases such as potato and quinoa topped with their choice of more than ten sauces and garnished with one of six options such as root vegetables and turmeric onions. LuAnne’s Wild Ginger features a Pan-Asian fusion that offers a little something from every country around Asia, including Japan, India, Vietnam, and Thailand. 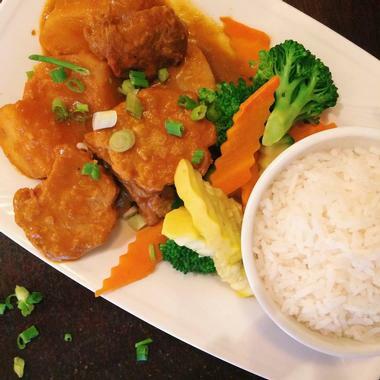 They expertly utilize seitan and soy in place of egg, meat, and dairy to create exotic dishes that delight. Entrees like the Black Pepper Seiten that feature thinly sliced medallion of wheat protein sautéed in black-pepper brown sauce and laid on a bed of Chinese broccoli are great for those looking to get a little mock-meat fix. For those who love the plant-based dishes, the house Bi-Bam Bap is an excellent choice; just be sure to top it off with their house-made peanut sauce. Mother of Pearl offers a delightful Polynesian fruit and vegetable focused menu allowing plant-based proteins to take center stage. This begins with their plates for sharing, which include items like Apple & Sweet Potato Poke with pomegranate, pumpkin seed, tomatillo, and forbidden rice and their Butternut Squash Dumplings with cabbage and red chili vinegar. For main dishes, guests can choose from menu items such as the Pearl Burger, a vegetable and grain patty topped with charred pineapple, pickled jalapeno, onion, and lime chili aioli. On the lighter side, they have Avocado and Ricotta Toast, which is sourdough topped with sriracha maple syrup and black lava salt. Peacefood Café was founded in 2009 by two vegans, Eric and Peter, who shared the simple idea that “peace begins on your plate.” They hope to demonstrate how tastefully easy non-violence can be with their delectable food. The completely vegan menu consists of soups, salads, sandwiches, focaccia, pizzas, vegetables, and raw dishes. Guests will find everything from the Other Caesar salad and a modern twist on lasagna to Asian Greens and a sushi roll made with walnut pate and seasonal julienne vegetables served with a jicama-carrot medley and topped with avocado. Diners can finish with a tasty snack like oatmeal-cranberry cookies or mini brownies. 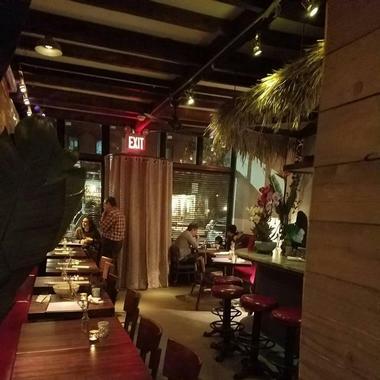 Red Bamboo in historic Greenwich Village is a restaurant committed to redefining veganism with their comfort food-style vegan menu that utilizes mock seafood and meat to create innovative dishes. Open since 2002, the restaurant consistently adds new items to its already homey menu, including favorites like tater tots, chicken and fish tacos, curry wings, and even a classic breakfast sandwich. With burgers, sandwiches, heroes, salads, and an eclectic list of main dishes, guests can enjoy hearty choices such as the Philly Cheese Steak with tender roasted beef slices, caramelized onions, and melted vegan Daiya cheddar topped with BBQ sauce on toasted hero bread. 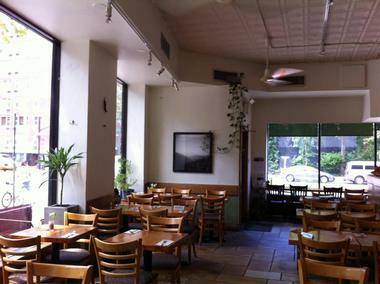 The Sacred Chow restaurant is owned and operated by Chef Cliff Preefer. He created a place where guests could enjoy cuisine without sacrificing their values in relation to sustainability and ethics. 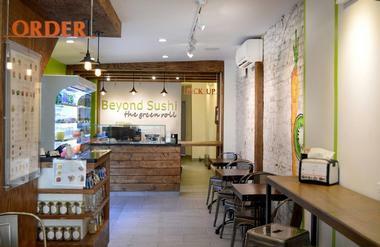 His menu is 100% plant-based, organic, and kosher, and items are hand-made. 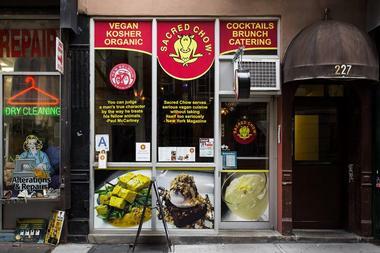 Sacred Chow, designed to provide fresh, quality food that tastes good, was voted the number one vegan restaurant in NYC by Zagat. The classic menu offers soups, salads, paninis, burgers, tapa towers, power bowls, brunch items, and heavenly desserts. Guests can indulge in everything from Belgian waffles to Mama’s Meatball Parm panini, pan seared in spicy Sicilian sauce, and topped with melted parmesan and fresh basil. 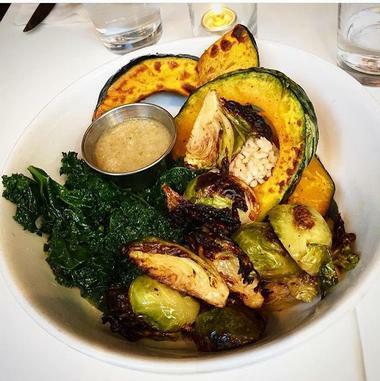 Souen has been serving natural, organic, vegan food to New York patrons since 1971, and they’ve only gotten better with time. Their menu consists of real traditional Japanese fare and divine Macrobiotic dishes designed to improve diners’ immune systems and help them live a more harmonious life. They prepare their food simply and naturally, utilizing traditional prep methods whenever they can to maintain the integrity and flavors of the food. Guests can enjoy items like Broccoli Tofu served over brown rice, a gigantic do-it-yourself sushi roll with choice of more than 10 fillings, and various soba, Udon, or rice noodle dishes. The Butcher’s Daughter gets its name by treating fruits and vegetables with the same precision and care as a butcher would meat; they filet, carve, and chop their way to healthy, organic, vegan dishes and satisfying juices. Their menu utilizes fresh produce from local farms to promote sustainability and freshness at breakfast, lunch, and dinner. Diners will find a changeable menu based on the seasons featuring classic American dishes as well as a few outliers like the Bangers and Mash. Starters, salads, toasts, burgers, and sandwiches make up most of their lunch and dinner menus with a number of interesting main dishes like their Raw Pesto Linguini. 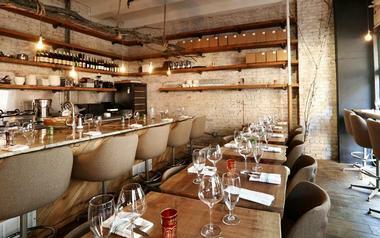 Modern Love Brooklyn offers innovative vegan food in an upscale romantic ambiance. The menu was created by owner Isa, who provides a down-to-earth approach to her culinary genius with a simple menu of elegant dishes from the appetizers to the desserts. Appetizers include items such as Brussels & Bacon with roasted carrot puree, shitake bacon, and flowers, Deviled Potatoes, and Truffle Poutine. Entrees include Bourbon Maple BBQ Tempeh, Hen of the Woods Piccata, and Jerk Yuba with Curry & Coconut Rice. For dessert, diners can indulge in warm cherry cobbler, warm brownie with peanut butter ice cream, and raspberry cheesecake, among others. 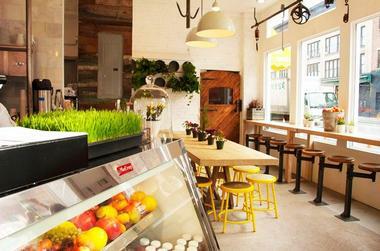 VLife is a quaint fast-food-style vegan restaurant with a bright and airy atmosphere and an extensive menu. The restaurant serves breakfast, lunch, and dinner, and guests will find smoothies, breakfast sandwiches, burgers, salads, sandwiches, wraps, brown rice bowls, and desserts. One of the best features of VLife is that they allow their guests to design their own dishes. To create a burger of their own, diners can choose from more than ten alternative meat sources, including soy pepper-steak and black bean patties. Then they can add in up to four toppings from kale to sundried tomatoes and top it off with one of their signature sauces. Brothers Danny and Alex Carabano and their friend Steven Simicich founded VSPOT Café & Tapas. They cater to the vegan diner with offerings of the Colombian variety. 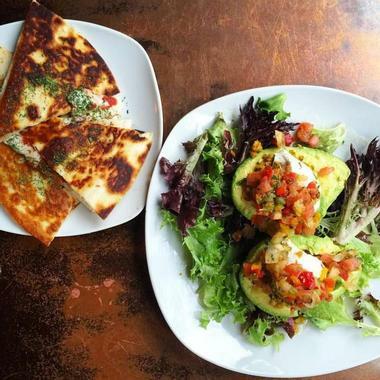 There are three locations with the East Village café housing the largest menu of the bunch, serving lunch, dinner, and brunch on the weekends. They get most of their acclaim from their traditional empanadas such as the Columbian packed with potato, carrot, onion, cilantro, Latin seasoned Seitan and served with fresh guacamole, but they serve much more. Arepas, tostadas, quesadillas, tacos, burritos, wraps, burgers, and house-made specialty entrees such as their Bandeja Paisa are also on the menu.